That question kept swimming in my head lately. It's haunting, it keeps echoing, reverberating, drowning all other noise. It's the only thing I hear. The thing that makes me wonder. Do you still love me? Years ago, you told me that I'm the woman you need, the woman who made you feel complete. The first time you said you love me brought a smile to my face. I was so happy. When I said I loved you, I meant it and I still mean it. I still love you despite what is happening to us. What happened? My tears just won't stop falling. They keep streaming down my face. I tell them to stop, but they just won't listen. They're hardheaded, much like the one who tells them to stop. I think I have cried my eyes dry. Or so I thought. Lately, I have been feeling numb. I don't know if it was the intensity of the emotions I feel or maybe I just don't want to feel anymore so that when I have decided to say my goodbye, I won't be affected as much. Yes, I am now torn into staying or letting go. And I think I have become attached to alcohol more than I would like to admit. I guess this is good so it will build up my tolerance for alcohol. And yes, it will also block any pain that comes my way. "They say you've found somebody new,"
"But that won't stop my loving you. Forget the love I had for you." I can't just let you go without a fight. Will I win, though? How could you leave without regret?" And you said that you'd have no one else after me. Now it makes me laugh bitterly. Seems the case, I can easily be replaced. You want her love much more than mine." I love you and you know that. I have loved no one as much as I love you. At this moment, I am not in my right mind as it is clouded by alcohol: alcohol that I have been taking since yesterday. I tried to take my life but I was such a coward. 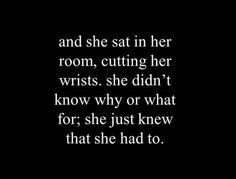 I felt the pain of the blade cutting my flesh and I couldn’t go through it. It hurt. Or maybe, I wasn’t drunk enough to not feel the pain. Hey, don’t cry. I’m not worth it. I could never compare to your one great love who has resurfaced. She still is the one your heart cries and long for. As for me, what can I do? Though in appearance I am the prettiest among the girls you’ve had but your eyes find her prettier than me. Though I have been with you for the past years, yet your heart has remained true to her.